All couples are accumulating their totals at a steady rate, so if we were to draw a graph plotting the couples total against time, each couple would be represented by a straight line with a positive slope. And each line would intercept the time axis on a day boundary (a negative integer, if we have t=0 to be the total collected by the end of Monday, t=1 the total collected by the end of Tuesday, etc). So, when couple X overtake couple Y, they are behind at all times before the intersection, and ahead at all times after the intersection. i.e. couple X’s line has a steeper slope than couple Y. And this is also the order of the slopes starting with the steepest. A similar argument working with the days is reverse order, tells us the order of the couples on Monday is the reverse of this. where a is the daily amount collected and d is the number of days the couple have been collecting on Monday. And we see this satisfies the conditions. On the Monday (x=0) we see couple 1 (red) is slightly ahead of couple 2 (orange), and then we have couples 3, 4, 5 (green, blue, purple). On the Tuesday (x=1) we see couple 2 (orange) has overtaken couple 1 (red), and then we have couples 3, 4, 5 (green, blue, purple). On the Wednesday (x=2) we see couple 3 (green) is slightly ahead of couple 2 (orange) and couples 4, 1, 5 (blue, red, purple). 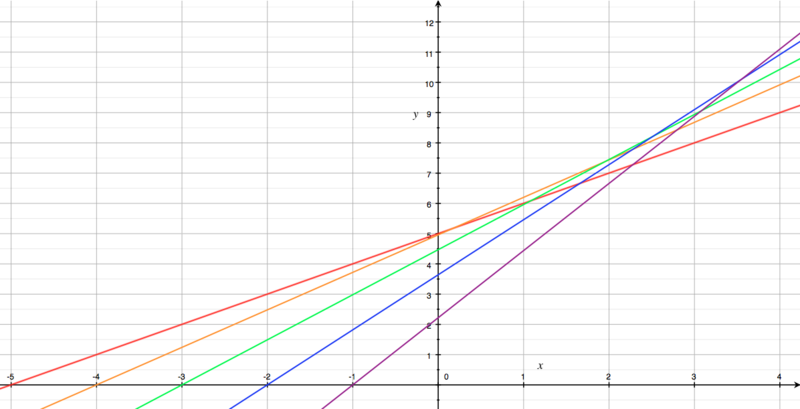 On the Thursday (x=3) we see couple 4 (blue) is ahead of couples 3 and 5 (green, purple), then couples 2, 1 (orange, red). On the Friday (x=4) we see couple 5 (purple) is in the lead, followed by couple 4 (blue), couple 3 (green), couple 2 (orange) and couple 1 (red). The final order is the reverse of the original order, and the relative positions will remain as the lines diverge. So does this make a viable solution? Solution: On Friday night the order was: 1st = Albert & Pamela; 2nd = Bill & Queenie; 3rd = Charlie & Rose; 4th = Desmond & Sue; 5th = Edward & Tania. But are there other solutions? Certainly we can choose different amounts for m1, …, m5, and different starting days for the couples. This will give us a slightly different graph, with different crossing points, but the order on Friday is always the same (and is always the reverse of the order on Monday). This MiniZinc model of the problem generates possible pairings and a table of positions for each couple on each day that satisfies the constraints given in the puzzle, but doesn’t determine actual amounts for each couple, so it does not verify that it is always possible to construct a graph for each scenario. However, it does find 64 different tables, but each has the same pairings and (as expected) the same ordering of couples on Monday and Friday, so this must also be the case for all possible graphs. Hence the solution to the puzzle is unique, and we have demonstrated a possible set of values that verifies it.